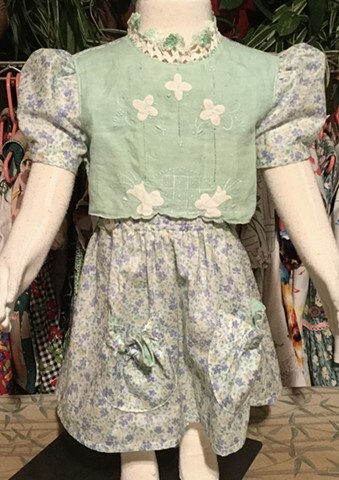 Delicate special events dress made from a fine cotton print created in England, offers antique linen appliquéd tea towel on bodice, crochet lace around neck, elasticized pockets. 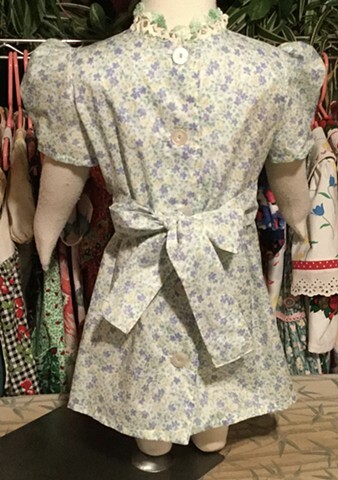 Size Toddler (1-2), measures 22” armpit to armpit, 18” shoulder to hem, puff sleeves, sash in back, closes all the way down the back with mother-of-pearl buttons. $60, 100% cotton, made by the designer herself and shipped free to any address in the U.S.